The text came in, “Fish are here!” “Where?”, I replied. 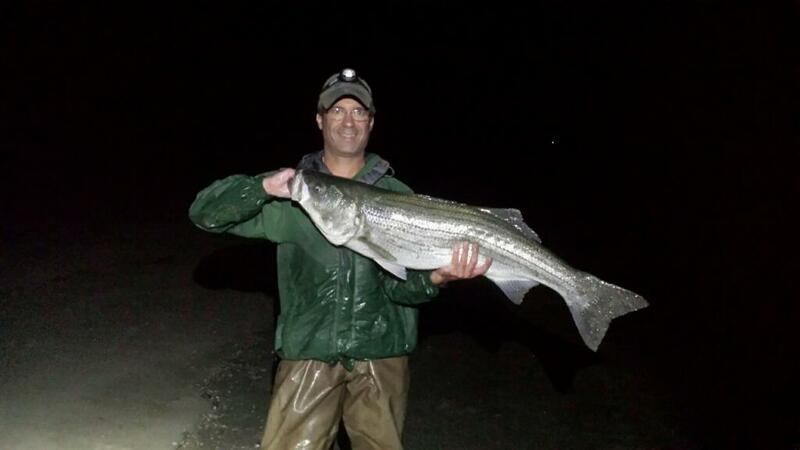 The response was accompanied by a picture of what looked like a 40-inch striped bass, “Where else can you get fish like this?” I knew immediately it was The Spot. I’ll let you know right now, good reader, that you will not be told where The Spot is. I was let in on The Spot a year ago by the same fishing buddy who texted me, who previously had been told by another friend. Fishing etiquette dictates you never reveal a spot you did not find yourself. If someone else has been so generous to turn you on to some hot fishing, then it would be incredibly bad form to tell the world where it is. Let’s just say it’s in Maine. The problem with The Spot is that it requires some work to get to. That’s why we call it a Fishing Triathlon. After a lengthy drive, a two mile—and somewhat illegal—bike ride on a trail is required to get to the beach. From there it’s a 15 minute walk in waders on soft sand. I suppose we could run to make it more triathlon-like but I think that would be taking it a bit too far. The water part of the triathlon comes into play next. This beach faces the full brunt of the Atlantic Ocean, so the surf is usually rocking and rolling pretty hard. Reaching the fish requires standing as far into the surf as you dare in order to cast your offering as far into the strike zone as possible. Getting wet is inevitable. The goal is to not get knocked over by a big wave and rolled in the wash. Paying attention is essential. Oh, did I mention this all takes place at night? 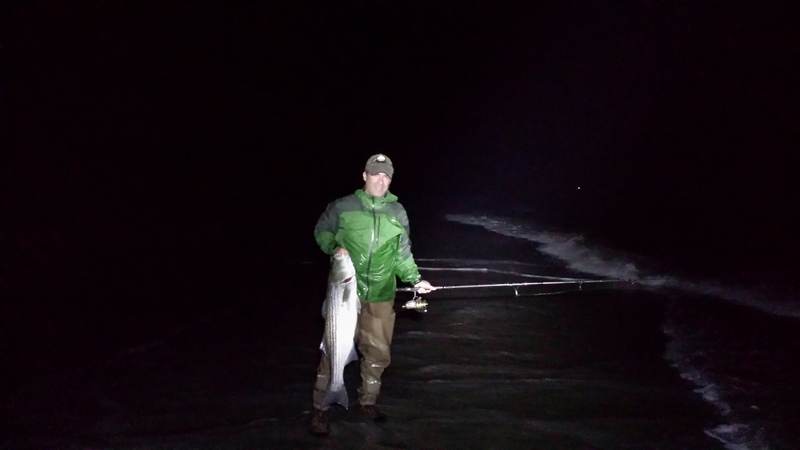 Surf fishing at night is one of the purest types of angling. It’s you against the magnificent power of the ocean. There’s no boat, usually no other people except your buddies and very few visual references. You fish by feel. With experience, you can discern an offshore sand bar from current, detect when your bait has slipped into a deeper hole, and just make out subtle changes in the water’s surface that indicate changes in depth. On this particular night the surf was very large. So large I left my fly rod at home and just brought one spinning rod. I am a fly fishing snob, so I prefer to catch all my fish with this ancient technique. But fly casting into big waves at night is about the most difficult type of fishing I can imagine. I may be a snob, but I also like to catch fish. A seven-foot medium/heavy spinning rod loaded with 17-pound test monofilament was the ticket for these conditions. I also prefer artificial lures to bait, but on this night we used bait in the form of the American eel. 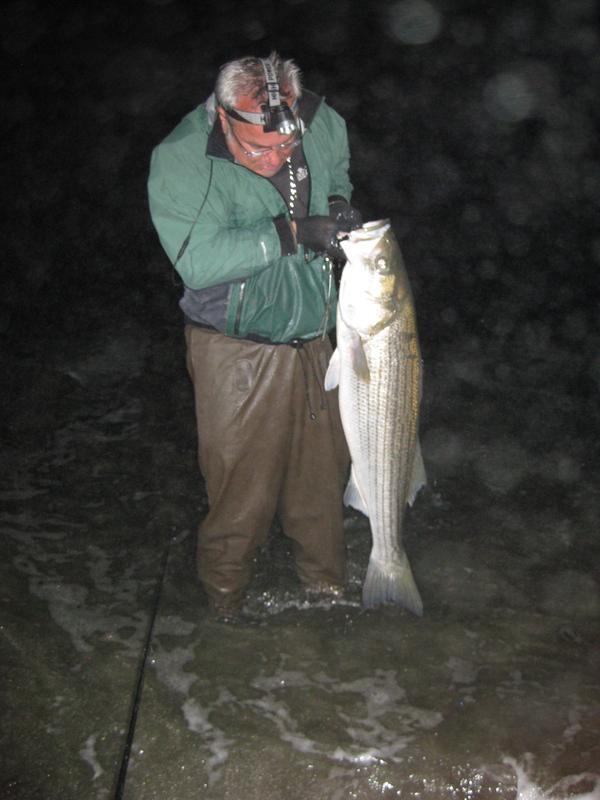 There is no more deadly bait for striped bass than the eel. Problem is they are slimy, nasty and just downright ugly. But I was able to put my snobbery aside because I knew what kind of fish tend to inhabit The Spot in late August and early September. Soon after arriving we started to hook up. The action wasn’t as hot and heavy as a year ago but the fish were nice, all in the 35 to 40 inch range, and at one point all three of us were onto fish. The surf was pounding and care had to be taken to stay attentive. More than once I was watching my buddy land a fish when a big wave rolled in and nailed me. Luckily, I didn’t go down but I came close. After an hour or so things quieted down and we went a long stretch without a hit. The tide was coming in and with it a building surf that was getting more and more threatening. It was after midnight and I was starting to get drowsy, but no one wants to be the guy who says “maybe we should call it a night.” I know we were all thinking it, especially since we all had to go to work the next day. I was working a little trough I had noticed earlier while wading into the beach, the perfect kind of place for striped bass to ambush prey on an incoming tide. Sure enough, a solid strike confirmed my feeling that a fish had to be hanging in there. After a bruising battle, a solid 40-inch bass was beached. This was enough for everyone to agree to end it on a high note and call it a night. Now it was time to reverse the triathlon and start the journey back to the car. We had each stashed a cold beer in our packs for the first leg of our return journey. Even though it was now warm, the setting and the shared adventure with my two friends made that beer one of the best I’ve had all summer. Awesome night and well-written story! And I won’t give up The Spot either. Thanks, Vic. Fish are still hitting! Thanks, Hazel. I appreciate you taking the time to read it.